The earliest evolutionary horse was Hyracotherium, also called eohippus or the "dawn horse" was only about a foot tall and had 3 toes in front and 4 toes on the rear legs. He lived almost 55 Million years ago. The horse was domesticated around 2500 B.C. Read more about that history here. Male horses have 40 teeth and and females have 36. Horses' teeth grow throughout their lifetime, making it possible to judge their age by looking at their teeth. A horse's stomach holds between eight and seventeen quarts. This is not very big considering their size and shows that they are meant to graze, taking in small meals and move around freely 24 hours a day. Horses can't throw up. Once food is swallowed, the valve between the throat and stomach is so strong it doesn't allow food to come back up. A horse's shedding in the spring is triggered by longer daylight hours, not the temperature outside. Research has shown that horses' favorite flavors are Fenugreek, banana, and cherry, in that order. The United States has (feral) wild horses, found mostly in the western states. They are managed by the BLM, or Bureau of Land Management and are offered to the public for adoption. Horses are measured from the ground to the tallest point of the withers in "hands or hh". A hand was estimated as the width of a man's hand, but is now equal to 4". The largest horse recorded stood at 21 hands, and was a Percheron, which is a draft breed. Ponies are up to 14.2hh (hands), with horses being any animal over 14.2hh. Horses have four gaits; walk, trot, canter, and gallop. There are gaited breeds that have have additional special gaits. Horses are prey animals. They run to survive, and only fight if they have to. A mare's gestation period is 11 months, making them slow reproducers. When a foal is born, it stands almost immediately and can run. Their brain is about the size of a walnut, but they are definitely intelligent! The lifespan for our equine friends is about 25 years, but the oldest horse recorded was 62 years old! Przewalski's Horse is the only horse whose lineage can be traced back to prehistoric times. This breed is native to the Southwest Mongolia. You must "cool out" a horse after exercise. You can't put them right into their stall when they are all hot and sweaty or they can become sick. They must be walked until their respiration rate is normal. The hoof of the modern horse is his third toe. The chesnuts on his legs are remnants of another toe. The mane and tail are for protection from insects. Whiskers around the muzzle are for feeling things. Check out The American Horse Council for more current issues and facts surrounding our equine companions today. 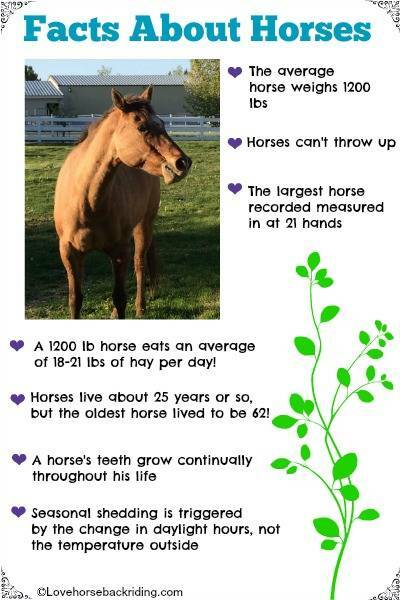 Mosey from facts about horses back to the home page where you can find all sorts of great information and tutorials!